We have Over 150K prints available for quick ship from our New Jersey warehouse that will arrive in time for the holidays. Need it in time for Christmas? Each product that you can still order for Guaranteed 12/24 delivery is marked as Christmas Delivery Guaranteed. Some of these items may require expedited shipping, please check the schedule below to determine what type of shipment method you need to select at checkout. Give us a call at 1-800-644-1278 if you have any questions! 1. Will my order arrive in time for Dec. 24th? 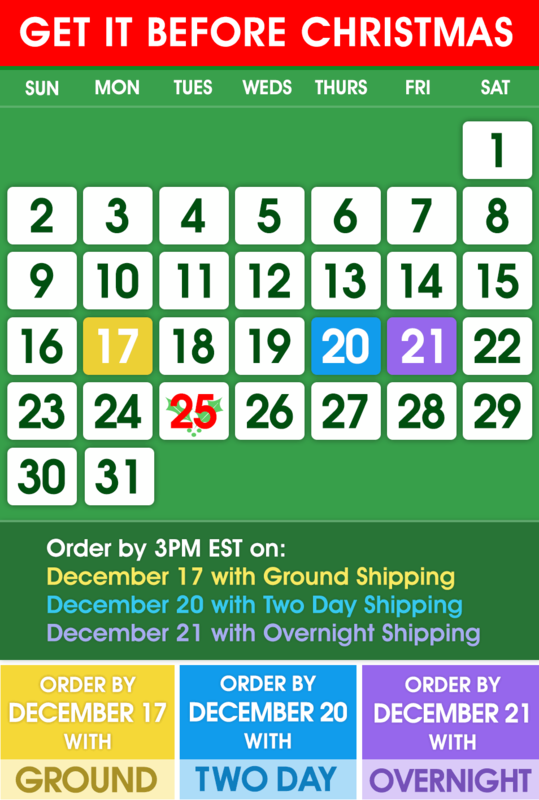 To ensure your order is delivered to your door on or before 12/24/18, please review the schedule above. The above schedule applies to all In-Stock items that we sell - even if they are being framed or ordered on canvas. We're working overtime to ensure these orders ship out on time! Order does not start processing until payment is confirmed. Unforeseen circumstances such as extreme weather could cause delivery delays with UPS. 2. This is a gift. Do you include the price in the package? 3. Is the return policy extended for the holiday? Yes. As always, we offer a 100 % satisfaction guarantee for 30 days, however for all orders placed between November 15th and December 31st, if you are not completely satisfied with your purchase, you may return it by January 31, 2019 and receive a free replacement or full refund (less shipping and handling). 4. Can't think of a gift and running out of time? Learn about our Gift Cards. A FulcrumGallery.com Gift Card is a great way to give someone the ability to beautify their environment, and makes a perfect last minute gift. We will physically mail you a gift card, which is a small plastic card the size of a credit card. You may choose to personalize it by adding the name of the person you are giving it to and your name, which will be printed on the back of the card. We will mail out the gift card the same day you purchase it, and you have the option to use express shipping to receive it as soon as the next business day. Our gift cards never expire, and can be used with all promotional offers and sales. Gift cards can be redeemed by entering the unique gift certificate code (printed on the gift card) in a special field in the shopping cart. This letter is something I've never taken the time to do until now, having experienced the best Customer Service organization/team I have ever encountered.